Chris and I had the car loaded, checked out of Best Western and were headed north on US 1, while the crack of dawn was still reverberating in morning sky of Maine. Our first stop was the Amtrak station in Freeport, founded in 1789. After a quick check out of the station, we headed out of town. While enjoying this little town I spotted the L.L.Bean sporting goods store. Had I known it was open 24 hours, I would insisted we stop if only for a few minutes to experience the aura. One of my favorite shirts is a L.L.Bean Scotch plaid MacLeod clan shirt. It is wrinkle free and travels well. This is my cousin's clan. Continuing out of town on US 1 north it was very soon that we arrived at our next stop. Industry, recreation and education are important pursuits in Brunswick, the chief city of the eastern Casco Bay area. Industry began in the 1620s when an English trader's success with exporting sturgeon and salmon from the falls of the lower Androscoggin River induced his company to establish a post. From that time until about 1730 the settlement of Pejepscot rose and fell as warring Native Americans destroyed it in 1690 and again in 1722. Our reason for being in Brunswick today was for Chris to ride Amtrak Downeaster southbound from Brunswick to Portland. He needed this leg to help finish his complete trip over all Amtrak routes. The Downeaster leaves Brunswick at 7:05 am, stops in Freeport at 7:20 am and Portland at 7:50 am. So Chris boarded the train and then I drove down to Portland and meet him. This train was parked across the street from the Amtrak station. This is a tourist train operated by the state but I fear its days are numbered. After Chris boarded train # 682, I left the station and drove to Portland via I 295. Arriving in Portland at the Amtrak station, I found a space in limited-time spot, made a stop at the restroom and then was able to be waiting to welcome Chris to Portland as he departed the Downeaster. From the station we drove to the Portland waterfront. Now I have been to two different Portlands. Here and Oregon. Some of the cruisers would join us on our train ride. 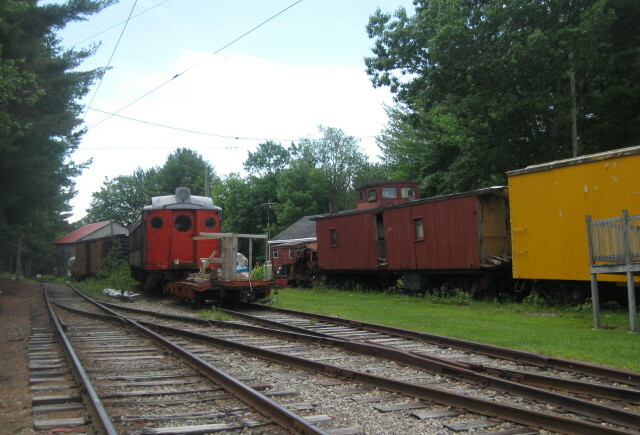 Across the street from the cruise ship is the Maine Narrow Gauge Museum. The city wants to develop their water front and the railroad sits on very desirable water front property too valuable for use by this little railroad. 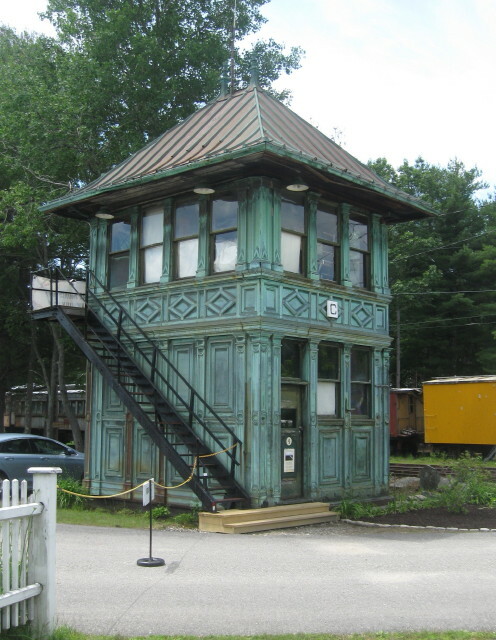 Not wanting to stand in the way of progress, the Maine Narrow Gauge is relocating and moving to Gray, ME 16 miles north on I-95. Read about their new home in my Chapter Fifteen. But this is a great location for a scenic railroad ride. Fuel for missing steam engine. This kind of railroad car was commonly referred to as a combine. A combine (combination car) accommodated both passengers and freight in two different sections. Exiting the building, I could see that the crew was putting the train together by eliminating the breaks in the consist. Once we were all coupled together we were then allowed to board and find a seat. Once boarding was completed the train ran in reverse direction towards the cruise ship where we picked up additional passengers. By picking up these additional passengers our census doubled. Proceeding forward the train moves gracefully along the shore line. What great views, so glad I was able to experience this train ride before it is gone and disappears. Although the scenic values were good, the length of ride was not good. We could only travel to the bridge. It is closed to traffic because of a fire damage in the truss and because the railroad was being relocated, there was no reason to repair the damage. Stretching at the end of the line stop. Some of the fire damage. Welcome to the Seashore Trolley Museum. After picking up our tickets, we had about 20 minutes to explore before the next ride departed. Burton B. Shaw, South Boston Car House. State of the Art Cars Riverside Car Barn. Arundel Station. I wonder if the name is related to the Anne Arundel County in Maryland? State of the Art Cars, Riverside Car Barn. Car 303 our first trolley to ride. Waiting area and boarding platform. We boarded Car 303 and took the front seat to get good photos. Our track will be the one on the right side of the parked cars. From 1904 to 1921 the trolley serviced the dairy farms that saturated this area before the trees started to grow. We will now board car 5821 to ride it. Chris and the conductor talking shop. Other end of car 5821. Our ride ended at the station and then we went back to exploring the rest of the campus. Chris is standing next to the open air trolley. Car was used in the winter for a open sleigh ride. Bundle up and drink hot cocoa and see the winter wonderland. Used to sweep snow off the tracks. Inside the Town House Restoration Shop Observation Gallery. While in high school I rode many of these electric buses to my part time job. I would walk from home to the bus stop and board a diesel bus. This bus would take me to the end of the electric bus line where I would transfer and continue my journey to downtown on the big quiet bus. I remember that the steering wheel as extra big, maybe a meter in diameter. I don't think they had power steering on these buses. An other thing were the foot pedalss for the operator. There were two big pedals, one to go and the other to stop. They looked like small paddle boards. These buses pulled away from the curb quietly and left no exhaust behind. Would like to see the LA Metro install some of these electric buses on the streets of Los Angeles. Maine Turnpike I-95 heading south to Boston. Once we arrive in Massachusetts, we take I-495 to our nest stop. Lowell National Historical Park was the birthplace of the American Industrial Revolution, thanks to the potent combination of abundant water power and an early bit of industrial espionage - mill founders stole technologies in England. As the National Park Service puts it "Lowell was the Silicon Valley of the early 19th century." But the most interesting part of this urban national park isn't Lowell's economic success (or its later decline) but the Lowell "mill girls." They were young, recruited from all over New England for jobs in the burgeoning textile mills along the Pawtucket Canal. Tempted by decent wages, lodged in boarding homes, the girls moved out of a farm economy and into a developing industrial society. Their choices altered the communities they left and the aspirations of girls who follow them. By 1850 they had helped make Lowell the second-largest city in Massachusetts as more workers flooded in from other parts of America and from Europe. Lowell's mills operated well into the 20th century, but modern industries gradually located elsewhere, the factories closed and Lowell went into decline, leaving huge brick factories and warehouses virtually empty. In 1978 the National Park Service stepped in, tacking on the enormous task of interpreting an industry and the lives of people who worked there. This display was at the end of our trolley ride. End of line for today's ride. Our trolley ride today, Car 1602. I've seen a few Desires in several cities. After our great visit in Lowell, we head for Chelmsford, MA for tonight's stop. Why this location? Because it is close to the Alewife Station and our ride to Boston tomorrow. Tonight was laundry night and our Best Western had no laundry facilities. As I was exploring the property I stopped by the pool area and chatted with the pool manger. He gave me direction to a local laundromat. I told him that Chris and I had been traveling for three weeks in New England and tomorrow we were headed to Boston and I was going to see "Old Ironsides" which I wanted to see since first learning about it in fifth grade. When he said that the ship was in dry dock, my heart stopped and my stomach turned over several times. But then it took a turn for the better when he said that the dry dock was just a couple berths from where it is docked and displayed. So I would be able to see the ship after all and in the dry dock where it was first built. 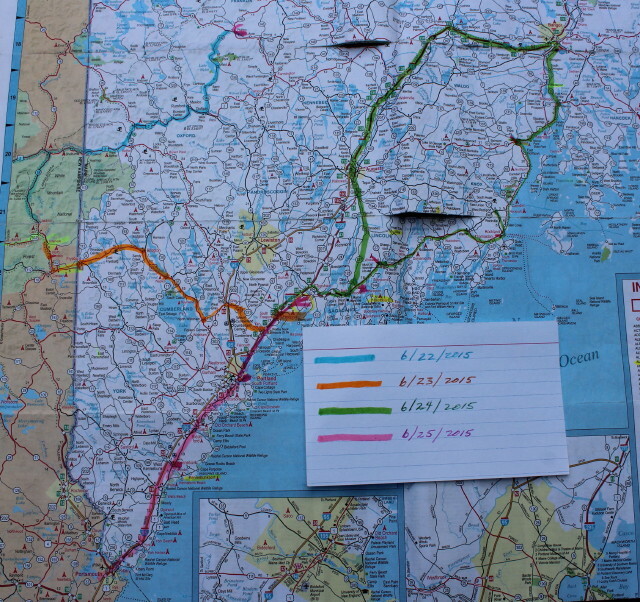 Map of our four days of travel in Maine.